STUDENTS, PARENTS, BEWARE! 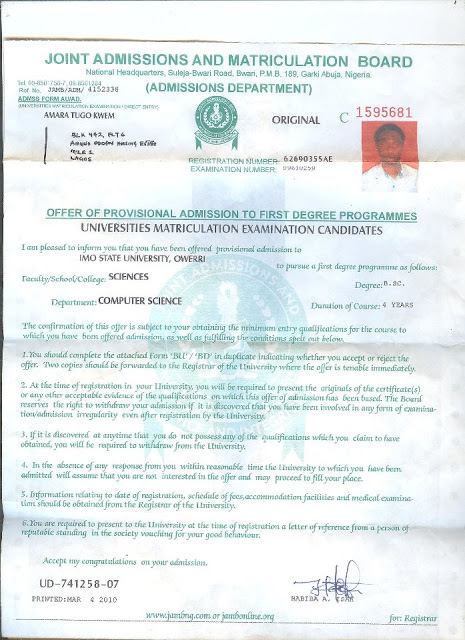 FAKE JAMB ADMISSION SYNDICATE IN LAGOS! A cybercafe allegedly being run at No 9 Ojora Road, beside JAMB Office Ikoyi Lagos is involved in massive Joint Admissions Matriculation Board (JAMB) admission scams. The cyber cafe being operated within the Nigeria Police quarters in Ikoyi is reportedly engaged in duping unsuspecting students desperately seeking admission into various Nigerian universities and polytechnics. The attached ‘admission letter’ issued to Master Lucky Odigie after parting with huge sums of money attests to the authenticity of this claim! The cybercrime has been going on for some time now and JAMB officials with the security men appear helpless! Dear students and parents, beware of the touts and criminals that operate in the cyber café. For admission matters, kindly proceed straight to the nearby JAMB office located at 11 Ojora Road, Ikoyi, Lagos. Do not follow any touts into the next building where you will be duped. PreviousPrevious post:Memoirs…..S4C’s televised youth debate on Galaxy TVNextNext post:AIG M.D. Abubakar: Can this man be trusted with national security?